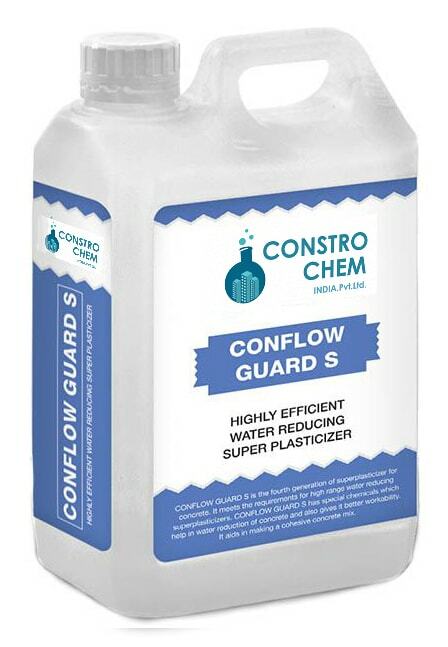 Superplasticizer is the fourth generation of superplaticizer for concrete. It meets the requirements for high range water reducing superplasticizers. It is also called as Conflow Guard or Polycarboxylate Ether. Super plasticizer admixture has special chemicals which helps in water reduction of concrete and also gives better workability. It aids in making a cohesive concrete mix. Basement Concreting, Flat Slab, Beams, Columns, Slabs etc. Water Reduction – Reduces water requirement for getting high slump in concrete thus gives high strength concrete with reduced permeability.